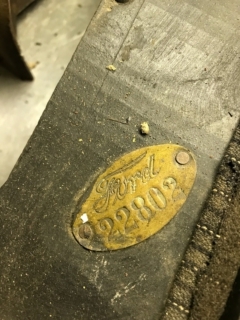 Model T Ford Forum: What is brass tag for? What is brass tag for? Model T Ford Forum: Forum 2018: What is brass tag for? This tag is on the rear seat frame on a 22 center door. Rich, its my buddys car. I posted a couple days ago about helping get the 22 and 21 DB out of storage. His daughter asked as they are cleaning the 22 up and found this tag. I will ask about body maker. 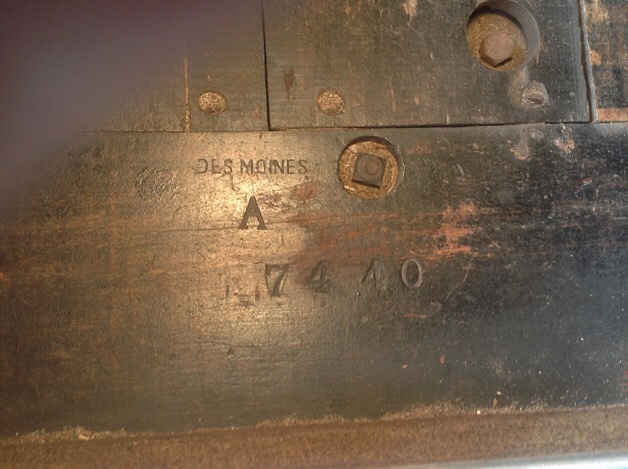 Is there a place to look for body maker mark? Dallas,Sorry to say i don't know about this tag but Ford used tags on machinery and tools. I thought many if not most center doors were Fisher Body? Those brass tags can be found on e-bay and Chevy also used them to id machinery. Bud in Wheeler,Mi. From what I can tell, Fisher and Wadsworth built center door bodies at first, but the Wadsworth factory burned down about 1919 and it is unclear ( to me at least) as to whether they built center doors after that. I have not been able to find any tags or stampings on my 1922 sedan body. This is what I found on my '22 Centerdoor. This is from my '22 Centerdoor project. There seems to be about 6 Centerdoor's in the Michigan area with the same type tag and no other stampings....anywhere. Thanks guys. They will look for stamping in wood as they clean it up and get it ready for the road after 16 years in storage. Another out of the barn and on the road.